Het systeem is opgebouwd uit ca. 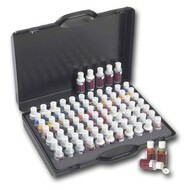 75 mengkleuren, waarmee alle kleuren kunnen worden gemengd zoals unikleuren, parelmoer, mica en metallics. Met behulp van dit systeem kunt u bijv. een bumperhoekje onzichtbaar herstellen of steenslag en kleine krasjes bijwerken. Hierbij is wel enige training noodzakelijk. 18401 Ultra fine white 60ml. 18404 Trace blue black 60ml. 18420 High strength blue 60ml. 18423 Trace yellow oxide 60ml. 18429 Transparent golden yellow 60ml. 18430 High strength transparent green 60ml. 18431 High strength phthalo green 60ml. 18440 Trace red oxide 60ml. 18451 Extra fine white pearl 60ml. 18452 Fine white pearl 60ml. 18454 Bright red pearl 60ml. 18455 Fine Blue pearl 60ml. 18461 Golden yellow pearl 60ml. 18462 Fine red pearl 60ml. 18471 Extra fine Metalic 60ml. 18472 Fine Lenticular metal 60ml. 18475 Medium Lenticular metalic 60ml. 18476 Corce Lenticular metalic 60ml. 18477 Extra corse metallic 60ml. 18479 Coarse Silver Dollar metallic 60ml. 18489 Medium aluminium gold 60ml. 18490 Tinted clear additive 60ml. 184000 EB Crystal Silver 60ml. 184001 EB Sunbeam Gold 60ml. 184002 EB Radiant Red 60ml. 184003 EB Galaxy Blue 60ml. 184004 EB Stellar Green 60ml. 184005 EB Solaris Red 60ml. 184006 EB Fireside Copper 60ml. 00.303 1K Clear Coat Aerosol 400ml. 00.303K2 2K Clear Coat Aerosol 400ml. 00.304 Carpaint Primer Aerosol 400ml. 00.304H Carpaint Primer HIGH BUILD Aero. 400ml. 00.316 Fade Thinner Aerosol 400ml. 00.080 Grinding mass fine 250ml. 00.079 Grinding mase coarse 250ml.